Our Manufacturing division recently completed this impressive 70m x 25m four-part building wrap in Hyde Park for one of our established clients. 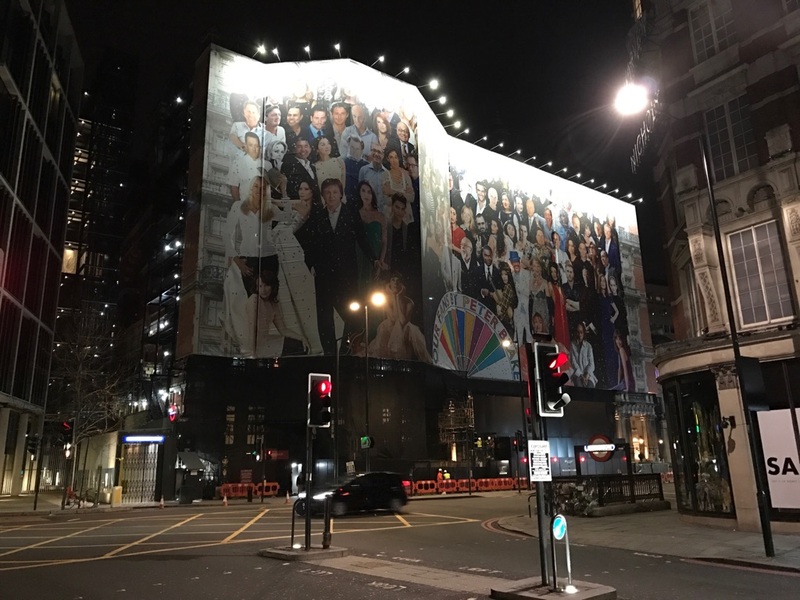 The image is taken from artist Sir Peter Blake’s collage of regular prominent guests of the Mandarin Hotel, done in the spirit of The Beatles’ 1967 album cover for Sergeant Pepper’s Lonely Hearts Club Band. Blake was commissioned by the Mandarin Hotel to create artwork to cover the building facade during renovation work. The images were printed onto PVC banner material in 5m x 25m strips which were then welded into larger sections. These were then assembled on-site during installation with barely-noticeable joints. The whole project was very fast track with a manufacturing and delivery window of only three days. The final result was stunning and received numerous commendations, with the hotel management saying “We really cannot thank you enough for all your help and support with this project – it looks amazing”, and our own client adding “Amazing job guys. Thank you!”.